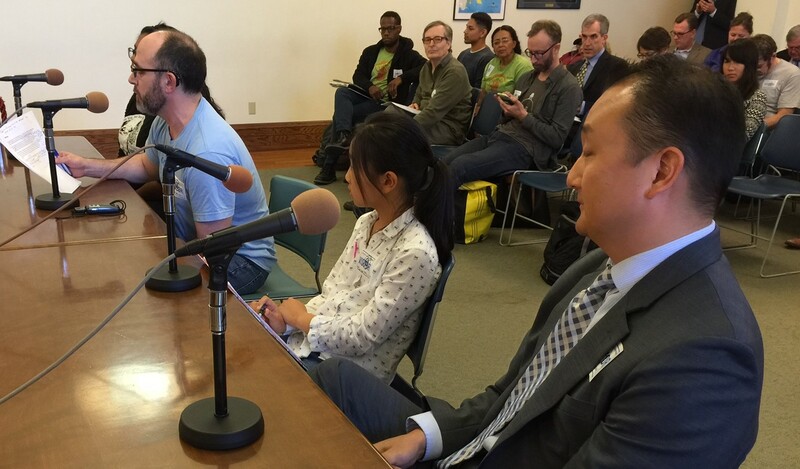 Ten-year-old Rachel Lee (center) speaking in favor of bike lanes on Westwood Boulevard and throughout Los Angeles. Photo: Joe Linton/Streetsblog L.A.
L.A. City’s Mobility Plan 2035 suffered a potential setback at today’s meeting of the Los Angeles City Council Transportation Committee. Today’s action likely sends the plan back to the Planning Commission for further decisions. Mobility Plan 2035 was approved by the City Council in August 2015, then challenged in court. Due to the legal case, the plan was then re-approved and then re-re-approval got underway. On the Transportation Committee agenda today was a modest set of minor plan amendments, most notable for what they did not include. Councilmembers Paul Koretz and Curren Price had requested that the City Planning Department (DCP) amend the approved plan to remove bike facilities designated for Westwood Boulevard and Central Avenue, respectively. Koretz and Price’s anti-bike amendments were rejected by DCP staff and by the City Planning Commission in February. Attending today’s Transportation Committee meeting were Chair Mike Bonin and committee members David Ryu, Jose Huizar, and Koretz. Public testimony at today’s hearing was near-unanimous in urging the committee to “keep the network intact” by approving DCP’s minor amendments as is. TRUST South L.A. representatives and others focused on keeping Central Avenue in the bike network. UCLA and other Westwood community interests emphasized keeping Westwood Boulevard in the bike network. The loudest applause came for 10-year-old Rachel Lee who gathered over 200 signatures in favor of implementing bike lanes on Westwood Boulevard. Additional speakers in support of an intact plan included representatives of AARP, Fixing Angelenos Stuck in Traffic, the Los Angeles County Bicycle Coalition, and Pacoima Beautiful. After public comment, a lot of committee discussion was focused on procedures for any potential plan amendments. The lawsuit that attacked the plan criticized the process by which the plan had been amended. Under the city charter, any amendments made by the City Council must go back to the City Planning Commission for approval. City staff appeared somewhat nervous to respond committally to process questions, given the prior lawsuit. Koretz proposed a plan amendment to remove bike facilities planned for Westwood Boulevard and Central Avenue. In the past, Koretz and Price had requested that these facilities just be deleted from the plan. Today, Koretz proposed that the bikeways be shifted to alternative parallel streets: Westwood Blvd to Gailey Avenue and Midvale Avenue, Central Avenue to Avalon Boulevard and San Pedro Street. DCP responded that they had only studied (and recommended against) removal of facilities from the plan, not modifying them, though, theoretically, alternate parallel facilities could be evaluated and implemented as part of the project implementation process. Surprisingly, Councilmember Huizar, a stalwart supporter of bicycling and multi-modal mobility, seconded Koretz’ motion, saying that he supported alternatives getting a fair hearing. The Koretz motion passed 3-1, with only Bonin opposing. This means that the anti-bike motion passed out of committee and will be heard by the full City Council at its 10 a.m. meeting this Friday. Both the Koretz anti-bike motion and the DCP minor amendments go to council. If the City Council approves the Koretz motion, then the new Koretz anti-bike amendments will need to go back to the City Planning Commission. If the CPC rejects the amendments, then it is possible for the City Council to override the CPC. Though much of the approved plan should be proceeding to the implementation phase, overall re-re-approval remains bogged down by the hostility of Koretz and Price. Jesse Max Creed should meet with some of the Bike advocates in this town. I’d love to help him take out Koretz. It is good to see that some councilmembers are basing their decisions on what is best for Angelenos and not on some foolish philosophy of Bicyclism. Bicycle lanes along major thoroughfares are a known health hazard, especially on an uphill incline when cyclists have peddle harder and breather deeper. The City’s MP 2035 has already been sued twice for its refusal to study the adverse health impacts of bike lanes in major thoroughfares and if they did not take this opportunity to study the health risks, they will find the MP 2035 rejected by the courts. Moving the bikes lanes off the major streets should solve the problem. There are enough studies from all over the world to show that the bike lanes do not have to be moved very far from the auto emissions to remove the health risks If the City only moves the bike lanes in Westwood to side streets and fails to study the auto emission problems for the other major streets, MP 205 will face court rejection. Now is the time to perform and EIR on the auto emissions near bike lanes. Hopefully, more councilmembers will follow Koretz lead and stop kowtowing to the myths of Bicyclism that everything to do with bikes is heaven sent. Filling our children’s lungs is something we can easily avoid if we drop the mythology of Bicycliam and pay attention to science.